How does this not change the focal point? Obviously you can change the focal length by rotating the lens body but does this not impact the automatic focusing sensors because they are expecting a different fixed length? That big EOS lens expects the focal plane to be somewhere around 40mm from the rear of the lens. The NEX cameras expects the back of the lens to about 18 mm. So that leaves plenty of room for adapters and new electronics. I think Micro 4/3 cameras have a sensor much closer to the mounting plate of the lens. The focal point of the lens doesn’t change but it was meant to go with a camera that had a mirror mechanism. The camera he is using (Sony) doesn’t have a mirror so the distance from the lens mount to the CCD is shorter than the EOS lens was designed for. Too much space and you can focus close for macro but lose infinity focus. Too much space, and you start losing close focusing. I’ve been wanting to do this for quite a while, ever since i got my Logic16. Does anybody see some documentation of the protocol used? I can’t seem to find any? Nice. A few years ago I wanted to use some SLR lenses for machine vision and looked into whether I could talk to Canon lenses, but didn’t find anything helpful; looks like this guy figured it out. I have been considering trying something somewhat related. I would like to add manual focus to my little Canon PowerShot SD4500IS camera. I have not looked into this in too much depth, but I would guess the auto focus is proformed by stepper motors in the lens assembly? 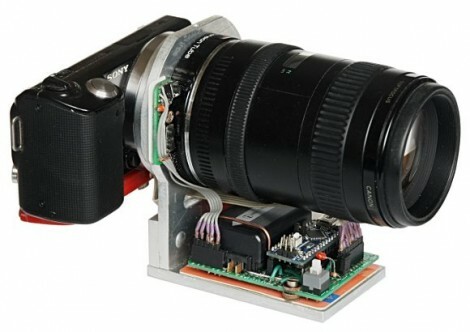 So maybe with the use of a small microcontroller I could manualy control the focus. If anyone has any thoughts I would love to hear them. Well done Vladimir, This is a really interesting project, I hadn’t really noticed the sony camera in there at first, I had hoped it was a canon camera talking to random lenses but either way it’s a very cool mod. I’d like to be able to convert canon signals to focus a telescope (telescope focuser mechanism has a stepper motor), I wonder whether that would work, as I’m interested in the signals that the lens sees rather than what the sony puts out this page could help a lot. or better, the drawing of the electronics.. I wonder if the digic processor in a power shot or g11 has the pins that would communicate with an ef/efs lens.